(1964) Jean Paul Belmondo, Jean Seberg, Gert Frobe, Enrico Salerno, Wolfgang Preiss, Fernando Rey. This hip film has a great cast. It's a caper movie with a touch of wit. JP plays a thief trying to smuggle gold from Barcelona to Beirut. Helping him is the beautiful, but mysterious Seberg. Both soon find themselves at odds with the criminal organization that wants the gold. The final scene features a car, loaded with gold, suspended high above the ground from a crane. Won't tell you what happens, but it's pretty cool. 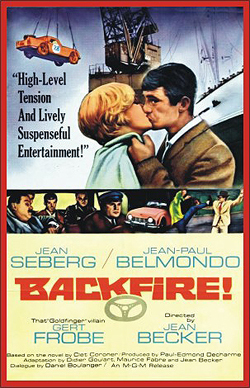 There’s a nice chemistry between Belmondo and Seberg, with Frobe also in fine form as the main bad guy. Belmondo, though kind of dorky-looking, was considered one of the hippest European-stars of the day. Frobe was fresh off his success in Goldfinger.